I learned about today's Feel Good Friday organization, Green For All, when watching a local town hall meeting earlier this week. Examples of people doing good work really are all around us. Green For All is a national organization, founded in 2007 "dedicated to building an inclusive green economy strong enough to lift people out of poverty." Their Facebook page summarizes their work. "By advocating for local, state and federal commitment to job creation, job training, and entrepreneurial opportunities in the emerging green economy - especially for people from disadvantaged communities - Green For All fights both poverty and pollution at the same time." Specific programs include supporting policies that direct money from carbon polluters to neighborhoods to provide green jobs, raising money to fix the pipes in Flint Michigan, mobilizing moms to fight cuts to environmental protections, advocating for the Clean Power Plan (a federal rule that limits air pollution from power plants and has been proposed to be discontinued), and encouraging governors to use settlement money from the VW emissions scandal to purchase electric school buses and reduce the carcinogens put out by diesel busses. You can learn more these programs by clicking the links above or watching some of the Green For All videos. If you want to get involved in building a green economy you can volunteer, download a Clean Power Plan toolkit, sign a petition to preserve funding for the Environmental Protection Agency or make a donation. 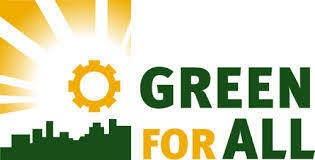 As always, stay in the loop by liking their Facebook page and following them on Twitter @GreenForAll.